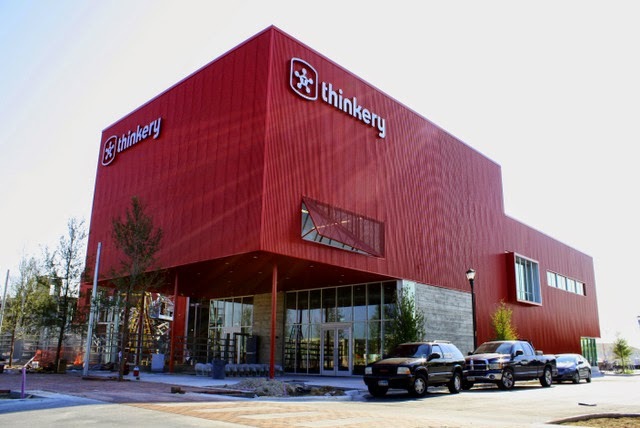 Have you had a chance to visit Austin's newest children's museum, the Thinkery, yet? They recently opened in the winter of 2013 and have been pleasing kids and adults, too, ever since. A visit to the Thinkery is on the checklist for the month of August so round up the kids and get it checked off! Don't forget to take photos of your children enjoying the items on the Summer Fun Checklist, and upload them to Instagram (hashtag #AustinSummerFun) for a chance to win a Junior Slugger's Kid's Club Package from Round Rock Express, valued at $130. This week's winner will be chosen on Friday, August 8, 2014. For complete rules, click here. The article below originally appeared on LiveMom.com. The Thinkery is mind-blowingly cool, y’all. And I’m an adult. Just try to imagine it through the eyes of a kid! Located in the Mueller complex, the bright-red building houses what looks to be hours upon hours of entertainment aimed at kids from babies all the way through age 11 or 12. 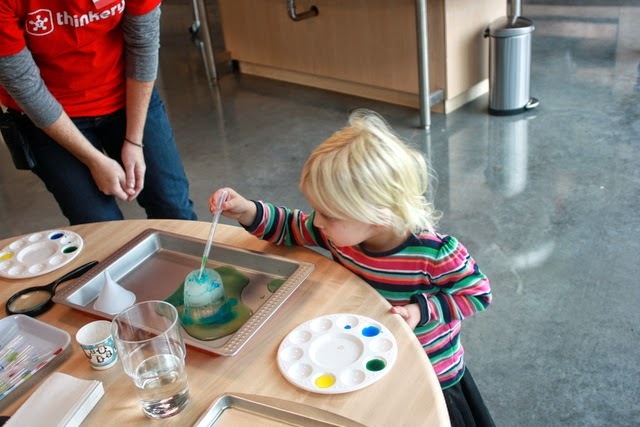 There’s everything from a splashy water-themed room -- basically a water table on steroids (and then some) -- to an innovative outdoor play area, from a glass wall that kids are encouraged to paint on and then squeegee clean to a room highlighting engineering concepts and facilitating projects that are a little too crazy for the average family’s garage (think flying projectiles and molded rubber), from a babies-only sensory play area to a kitchen lab. The painting fun is part of the ground-floor Innovator’s Lab, which features a variety of tools -- from woodworking to art to electronics -- to challenge young minds to create and invent. The climber, located in the outdoor play area known as Our Backyard (along with a play-encouraged fountain featuring rubber duckies and other fun things) is one of the coolest parts. It may look intimidating, but staff members insisted that it is navigable by 2- and 3-year olds -- and my own kiddo proved that right. I turned around for a moment, and she was all the way at the top! 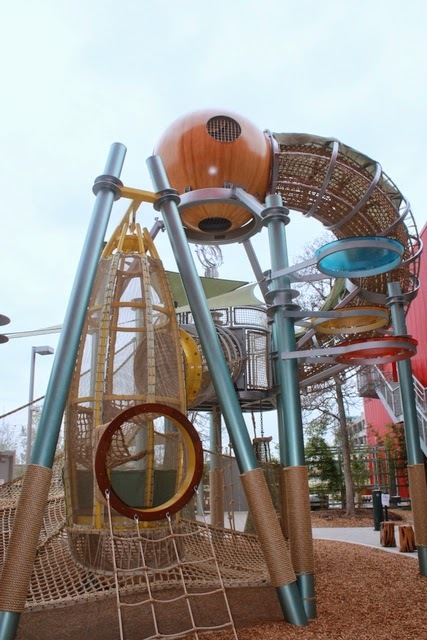 The rope structure makes it easy for those fearless little ones to climb all the way up in no time, while slightly older kids may need to muster the courage -- but they’ll still have fun. "They need the science and the art and the math," says Kassy Dehart, a staff member, "but they need to just run around, too!" Despite its undeniable fun, the climber is innovatively designed to make kids think while they play. For example, one area features a series of nets that children must drop through in order to climb out. Sure, they could turn around and go another way, but it pays to puzzle it out. Back inside is En Mi Familia, a family storytelling exhibit inspired by the art of Carmen Lomas Garza (a carryover from the old space), and right next door is a new feature exhibit called the Light Lab -- a darkened room with light pegs and tables and dedicated to the science of tinkering with light. 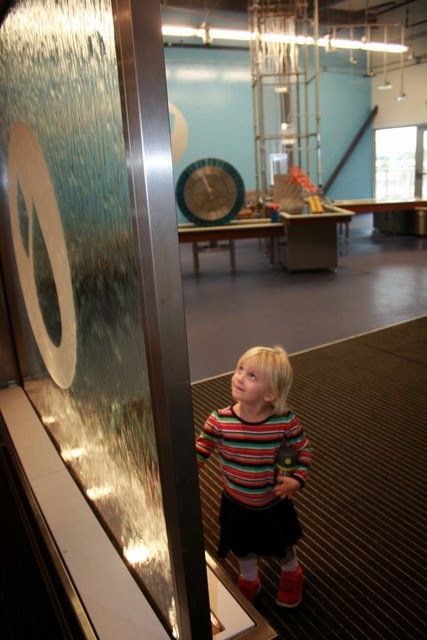 Upstairs, the water-themed room, Currents, is a dazzler for kids who love to get their hands all wet. 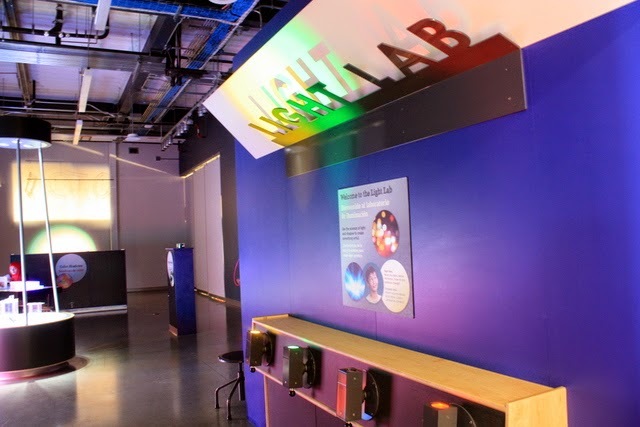 Dedicated to fluid dynamics and exploring water, the exhibit features 12 hands-on activity stations that allow kids to have a blast learning about water. Down the hallway is the Kitchen Lab, which will feature a number of cool hands-on experiments. 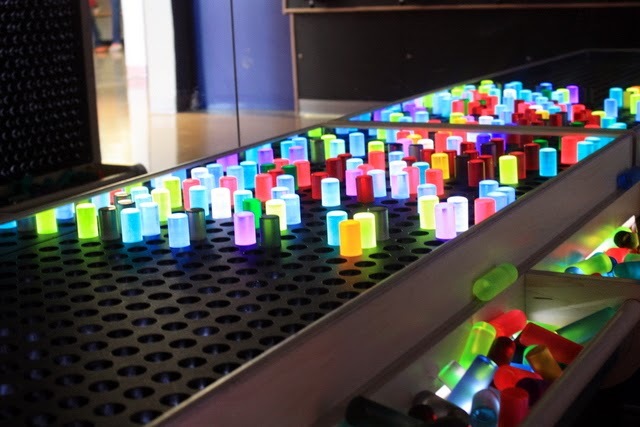 On this day, we were treated to an ice-tunnels project, which involved sprinkling salt on blocks of ice and then using pipettes to add color. "The salt lowers the freezing point of the ice, and it makes all these cool tunnels and divots," explains staff member Lauren Millikan. "Then we add the color, which lets us see the tunnels." Right next door, there’s a Farmer’s Market, where kids can “shop” and weigh their produce, an adjoining a chicken coop (complete with stuffed hens, which were a hit with all the kids) and a cafe, where kids can don an apron to plan and cook pretend meals. (complete with cushy chair, sink and changing table). 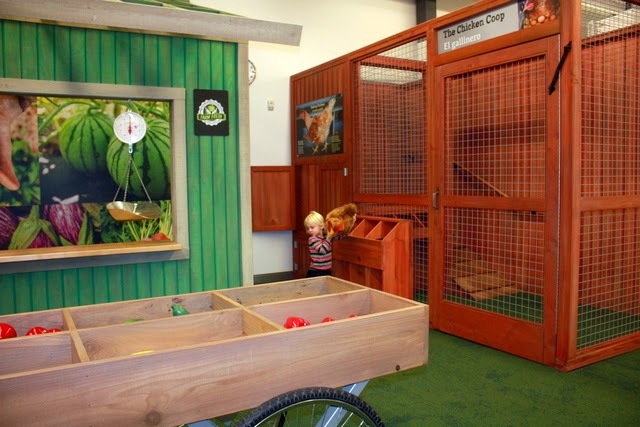 The Thinkery is a great place for families of all shapes and sizes. We had a blast -- all of us. And I bet your family will too! About the author: Lauren Walz is a freelance writer and editor and mama to two girl.s. While she's quick to brag about being a fifth-generation Texan, Lauren moved to Northern California in 2004 after graduating from UT Law and lived in the Silicon Valley area until last spring, when she and her family were drawn back to Austin. Lauren is busy getting re-acquainted with her old stomping grounds and is astonished by how the food and wine scene has changed in Austin in the past 8 years. Lauren also blogs about cooking and parenthood on gourmetveggiemama.com.